Season 2 Episode 1 of the LiveCampWork Podcast! In this Episode, I just wanted to jump back into the swing of things with a quick overview what’s to come in Season 2! Setting the stage for the next 12 episodes and my intentions for the big development underway on the LiveCampWork website. First and foremost I want to take a moment to thank everyone who has been listening in and downloading the episodes! Your guys rock and I love the support that comes from the RV community. At this moment we’re at the beginning of the 2nd season where I’m just about to take a look into several Workamping programs and ways to work on the road for RVers, but before I tell you all about what’s instore for the next 12 episodes I want to share some fun insights with you really quickly. Okay, so…. I received a random email saying that the LiveCampWork Podcast was ranking high in the Places & Travel category on iTunes- and literally thought it was SPAM. I clicked on the link to see the stats, although I was almost sure this would end up crashing my computer- but I did it anyway because I was super curious… and what do ya know… the podcast was in the top 100!!! Pretty cool and it was just the motivation I needed! So I want to say thanks to everyone who hit the subscribe button, downloaded the episodes and those who are able to leave a review- please do so…. 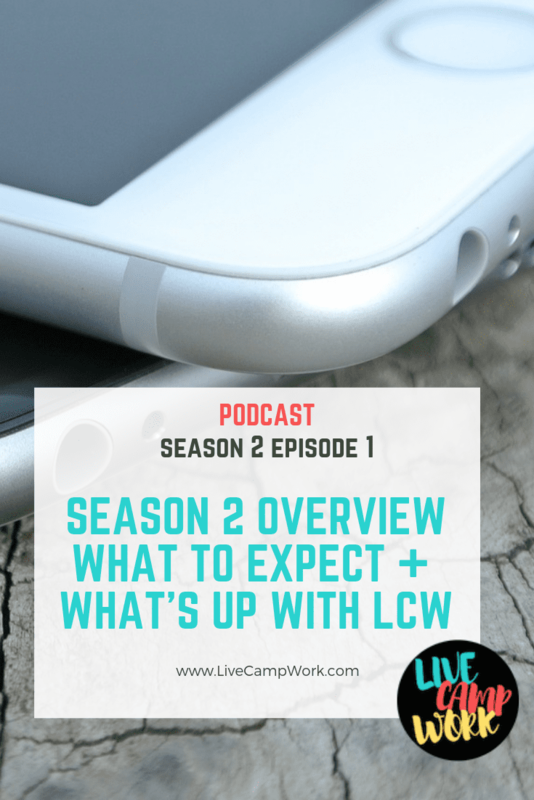 Okay, enough of that- Let’s move forward to the real content for today, the really reason you’re here listening in… Let’s talk about what’s coming up on the LiveCampWork Podcast for season 2! This season on the LiveCampWork Podcast I’m going to cover the details of several Workamping programs that are great for both newbies as well as experienced RVers. Many of these programs have been around for years and are tried and true, with an established flow of those who come back season after season. Others are new kids on the block and have either just started hiring RVers or their just not as well known, but made a good impression on me for one reason or another, and I thought you should know about them first! In each episode I’ll walk you through the details of what it really means to work for these companies, how much they pay and how you can go about getting the job if you’re interested. Most episodes will follow this format, while a few will spice things up by having a live interview from an RVer with a great story to tell. There are just so many amazing stories left untold- I don’t want to miss the opportunity to provide a platform for people to share their side of the story, ya know. Like we all RV for different reasons, we all do it in different ways, in different units and I just love to hear these stories while I’m out on the road. Campfire chit chat are never dull when folks start talking about their lives on the road, so we’ll share these stories as they relate to Living, Camping, & Working along the way. I’d like to tell you that I’ve got the whole season already planned and mapped out, but unfortunately its just not the case, so instead I’ll have to just figure it out as well go, which could be quite interesting and maybe more fun as well. I want to talk to you about the big changes happening online at LiveCampWork.com…. Basically, LiveCampWork is evolving pretty quickly… I now refer to it as my home away from home because when I’m not working for Workamper News or spending time with my family- I’m almost always putting time and effort into devloping some kind of new content for it and I am really just thrilled with what its developed into over just a relatively short period of what, like under 6 months. Originally I started the site as a way to keep up with the folks on my book launch team and then planned to keep it updated with the progress as well as updates and announcements that went along with the book being published. Probably a few days in- I realized it was more than an author website- and slowly began adding content that was being requested from the 400+ people on my book launch team. So a big special thanks to all the folks who helped me with the book launch, because they really helped push me forward! Over the last few months the site has evolved even further to now include printable resources for those living, camping and working on the road as well as those who hope to do so, I added this podcast, and a VIP list of super awesome folks who wanted even more from yours truly in the form of exclusive content, offers, and freebies. So- wow! Evolution is happening online! And I’m looking forward to 2019, where I’m focused on really tailoring the content to be a fun mix of all three aspects of fulltime travel- living, camping and working on the road in both audio and written content. Who knows I might even add a fun webinar or two in the mix… the options are really endless. Lastly, before I wrap things up for today, I want to provide everyone listening in with my free printable PDF of 57 QUESTIONS TO ASK YOURSELF BEFORE YOU START RVING. It’s a quick exercise to give you some much needed insight on where you stand, if you have yet to start your RV Adventure!!! Check the show notes to grab your copy!